I decided to make Sunday an all peerkangai day after dilly dallying with the question ‘what to cook?’ nibbling at my mind for a long time. The fresh stock of Peerkangai (Ridge gourd ) in the refrigerator wooed me into taking this decision. 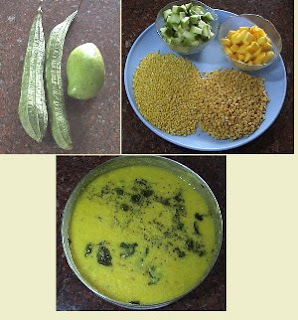 Peerkangai paruppu with a mango thrown in for the tang, peerkangy chutney for the spice and peerkangai bajji to crunch, accompanied the staple hot rice . With sips of hot jeera rasam in between, we did enjoy the peerkangai meal after all! 1. 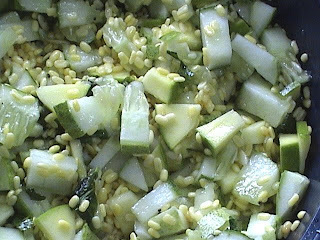 Scrape the rough ridges of the ridge gourd and cut them into cubes. 2. Peel raw mango and cut into cubes. 3. 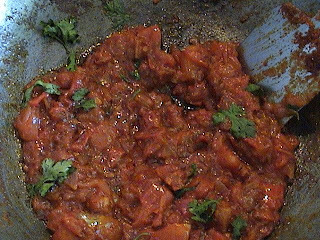 Wash both dals and add the cut vegetables and turmeric powder. 4. Pressure cook with 3 cups of water. 5. When all the ingredients are cooked, mash them together with the back of a ladle and add salt and blend. 6. Heat oil and add the mustard seeds. 7. When it splutters add the asafoetida powder and the chopped green chillies. 8. Add the seasoning and chopped coriander leaves to the dal. 1. Scrape the hard ridge off the gourd, and cut the gourd into small cubes. 3. When it splutters add the black gram dal and roast till it is golden in colour. 4. Add asafoetida and the broken red chillies. 5. When the chillies become crisp add the cut ridge gourd and sauté. 6. Decrease flame and cover with a lid. 7. Cook until the vegetable becomes soft, stirring it now and then. 8. Turn off fire and cool the ingredients. 9. Add tamarind and salt and grind it in a mixer. 10. 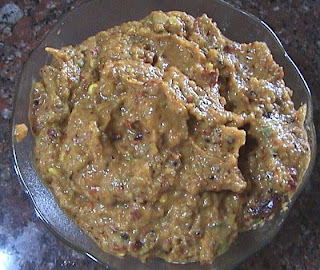 Remove the chutney when the vegetable becomes smooth and the dal is still coarse. 1. Scrape ridge gourd and slice it into moderately thick rounds. 2. Blend all the other ingredients with little water to make a thick batter. 4. Coat the ridge gourd slices with the batter by dipping them into it. 5. Drop the batter coated vegetable slices one by one into hot oil. 6. Turn them now and then to get an even golden brown colour when fried. 7. Drain on tissues and enjoy the bajjis with sauce or chutney while still hot. Note from Dibs: The peerkangais here in Syndey are literally giant sized and are more than a foot long! I often feel like Bhima carrying a peerkangai from the Market! It is called 'Sin-Qua' here, and found in the section for Chinese Vegetables!! At the age of fourteen, my father lost his mother while she gave birth to her daughter. My grand father was never around to take care of the kids, as his job in the railways often took him out of station or sent him on the ‘line’. My father’s grand mother (my great grand mother) had a tough time bringing up my hyper active father and his new born sister almost single handed. My great grand mother lived up to her 96th year to narrate amusing anecdotes about our father to us. Father made his reluctant aunt open the ‘ugranam’ (storeroom) where a variety of meticulously prepared savouries like tattais and murukkus were stored. After ransacking the stock meant to last for at least a couple of months with all his friends, he threw a sweet thank you at his bewildered aunt and marched away into the garden with his gang, only to return for refueling after a vigourous out door game! I have never taken any interest in learning to prepare these savouries as our needs were always taken care of by the elders in the family. Later on professionals were summoned to prepare them during functions at home. Nowadays these and many more savouries and sweets are available in shops which have sprung up every where in plenty. Here I have tried to prepare maida tattai for this post with the instructions of my enthusiastic mami (maternal uncle’s wife) who has mastered the art of traditional as well as innovative cooking. 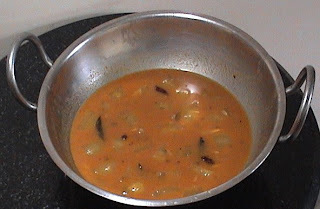 The required amount of maida is bundled up in a clean cloth and placed in a clean dry vessel.This vessel is then placed in the pressure cooker and steamed for 15 minutes without the whistle. After steaming, the maida will look like a hard dry piece of plaster of Paris. 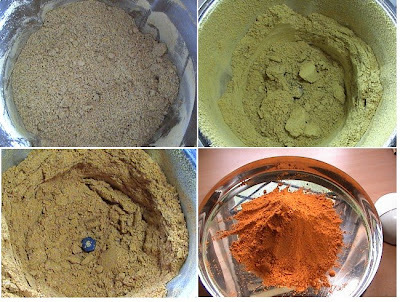 Crumble this into a fine powder using your hand. 1. Take a glass of the prepared maida in a wide mouthed vessel. 2. 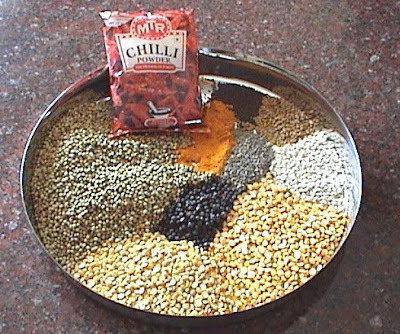 Add rice flour, roasted and powdered black gram dal, salt, asafoetida, ,spice powder, soaked dal and cumin seeds. 3. Add ghee or butter and mix the ingredients well till they look like bread crumbs. 4. Heat 4 tbsps of oil and pour all over the mixture and blend with a spoon. 5. 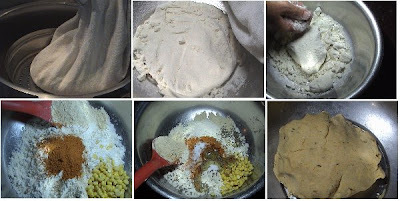 Add water little by little and make a dough, like you would for a chappatis. 6. 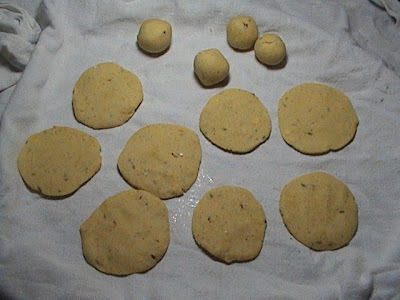 Make small lime size balls out of the dough. 7. Flatten one by one by pressing the ball between the palm of one hand, and the mount under the thumb of the other hand. 8. 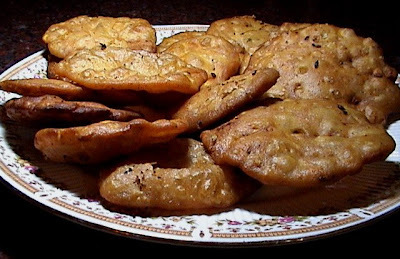 Make the tattais as thin as possible and fry them in batches of four or six in hot oil. 9. Drain them on absorbant paper and store in an air tight jar after it cools down. Some Notes from my trial: Tattais will crumble and break away in the oil, if the oil is not fuming hot. My first few tattais crumbled away into the oil. I then realized it is to do with the oil temperature. You can reduce heat if needed, when the tattais are half done and change colour, lest they may get burnt. Tattais do tend to need lots of oil, so if you are feeling indulgent, this makes an ideal accompaniment with tea or coffee!! Overall, the result was a very delicious and cruncy snack. WITH NEER MOR, PANAKAM AND VELLARI – MANGAI KOSUMARI. Ugadi arrived with a burst of tender green leaves and a colourful riot of flowers. More or less a fortnight after that the Tamizh new year has arrived bringing along the scorching heat of the summer Sun. The name of each Tamizh month is mentioned with a rhyming phrase which describes the weather conditions that particular month ushers in. ‘Adi katril ammium parakkum’- means even the grinding stone flies away in the Adi wind. ‘Aipasi madam adai mazhai peyum’ – refers to the heavy rains during the Aipasi month. Likewise Chittirai madam - the first month of the new year is famous for its Kattiri veyil (The Cutting / scorching heat of the Sun). While the new year is celebrated with the seasonal mango and neem flower dishes, cool and refreshing dishes and drinks - Panakam, Neer mor and Kosumari -form the integral part of the festivities. 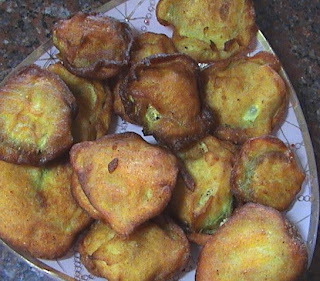 These were also prepared during the Sri Rama Navami festival. (Birth day celebrations of Lord Sri Rama). My mother’s mother was a multifaceted and dynamic lady. She was way ahead of her times in her thinking and actions. She looked every inch a perfect traditional ‘mami’ clad in her nine yards saree. She was very spiritual on the one side, and grandiose on the other when it came to entertaining guests, and magnanimous in her philanthropic activities. Her deft hands could swirl murukkus – a rice based savoury- with the same ease and perfection with which she played tennis. 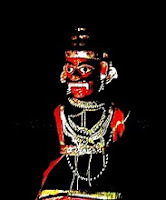 I remember the Tannir Pandal (A shelter or shade built with bamboos and coconut leaves under which water and neer mor was distributed during Summer) which she promptly erected in front of her house during the month of Chittirai. A large earthen basin filled up with clean sand was placed on a table. The huge ‘panai’( mud pot) full of neer mor (watery butter milk ) was placed on this basin. This way the drink stayed cool all through the hot day. Grand mother served the neer mor in glasses to thirsty passers by. She felt immensely happy when they blessed her after quenching their thirst. This beautiful custom which was practiced as a mark of compassion to the fellow beings, and to uphold universal brotherhood by many homes, has now become restricted to only a few youth associations or temples in modern days . 1. Wash coriander and curry leaves and skin the ginger. 2. Grind them with salt and roasted fenugreek seed powder into a fine paste. 3. Add curd and run the mixer until all the ingredients blend. 4. Pour it into a large vessel and add five glasses of water. 5. Cut the lime and squeeze out the juice into the neer mor. 7. Heat the oil and add mustard seeds. 8. When it splutters add asafoetida powder and the broken red chillies, and pour the seasoning into the neer mor. 9. 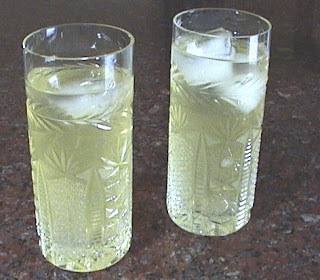 Chill and serve with ice cubes. Caution: Read about Camphor here. Camphor that you normally get is not edible. You need to ask particularly for EDIBLE CAMPHOR. Using the wrong camphor is poisonous! While edible camphor is mild compared to regular camphor, even the edible variety has a very strong smell and taste. Truely an amazing ingredient, and just a very tiny little spec will give your sweets and beverages a magical flavour - any more than that, will ruin the taste and flavour. 1. 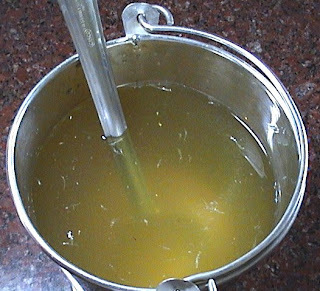 Dissolve jaggery in one glass of warm water and filter it. 2. Add the saffron strands while it is still warm. 3. Squeeze the lime juice into it with out the seeds. 4. Add powdered cardamom , salt and the dry ginger powder. 5. Crush the pache kalpooram between the thumb and the fore finger and drop the powder into the Panakam. 6. Add 5 glasses of water and chill. 1. Wash and soak split green gram dal for half an hour and drain. 2. Wash and cut cucumber and raw mango into small pieces. 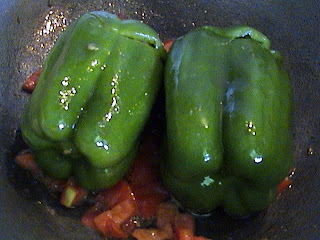 The peels can be retained if the vegetables are fresh and tender. 3. Chop the coriander leaves. 4. Mix all the above adding the salt. 5. Heat oil and add mustard seeds. 6. When it splutters add asafoetida and the chopped green chillies. 7. Pour the seasoning on the kosumari and mix before serving. All the three dishes are very nourishing and refreshing during hot summer months. They help in cooling down the system and prevent dehydration , nausea , loss of apetite and pittam(Biliousness) - the other common symptoms prevalent during the summer months. 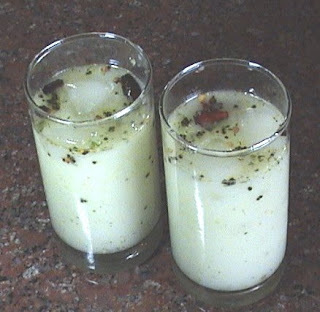 Tingalnagavalli is a function celebrated on the 30th day after a wedding. It was customary to have a nalangu or a get together on this day where the bride and groom were fussed all over once again. On my Tingalnagavalli day, though we did not have any traditional ceremonies, my father-in-law decided to invite all his friends for dinner. My mother-in-law prepared an elaborate and delicious dinner, while I ran around assisting her. My sister-in-law and me served the sumptuous hot meal on the green banana leaves. The guests treated themselves amidst good humour and animated chatters. They praised and blessed my mother-in-law for the delicious and lavish dinner. I was taken aback when I heard my father-in-law’s loud statement – “Thair pachadi was very good!” That dish was my meager single handed contribution for the dinner! When I come across men who keep pecking about even a minute shortcoming in the meal, or the ones who keep a long drawn poker face even if you had served the heavenly nectar on their platter, I always remember my father-in-law for his thoughtfulness and culture. His comment not only made me happy by enriching my self esteem, but it also inspired me to learn more. He savored my simple vellarikkai menthya kuzhambu with paruppu chutney and roasted papad with the same excitement and relish, as he would the rich and complicated Bisibele Bath. 2. Scrape (Peel can be retained if preferred) and cut the cucumber into cubes discarding the seeds if they are hard. 3. Add salt and sambar powder to the tamarind juice. 5. When it splutters add the fenugreek seeds and the Bengal gram dal. 6. When it becomes golden in colour add the asafoetida powder and broken red chillies. 7. Add curry leaves and pour the seasoning into the tamarind juice and boil. 8. When it starts to boil add the cucumber cubes . 9. Cover with a lid and cook on slow fire. 10. 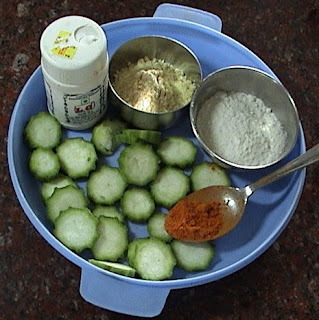 When the cucumber is glassy and done make a paste with rice flour and water and add it to the kozhambu. 11. Switch off flame when the kuzhambu thickens giving out a heavenly aroma. Relish the hot spicy and tangy menthya kuzhambu with hot rice and a spoon of thick ghee. 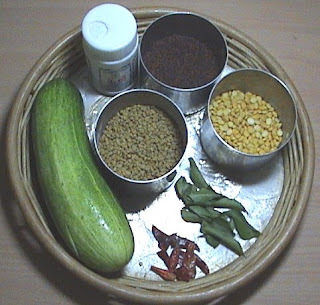 We've got few enquiries on the versatile sambar powder from this post, which finds uses in so many dishes and recipes in this blog, other than just Sambar! 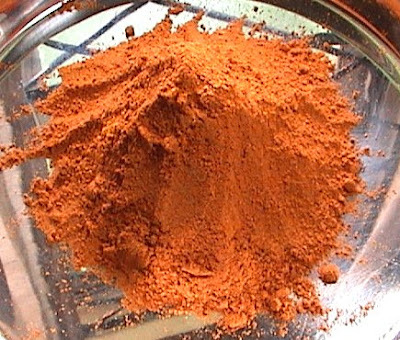 We will do a post very soon on Sambar powder to answer all those questions! The Summer Vacation has just begun and my grand children are greatly relieved that they got the much needed break from the boring ‘dabba’ lunch. They pamper themselves by getting up late in the mornings and have a late breakfast. For the first few days they were really grateful for the hot sambar, rasam, rice and curry meal for lunch. I know that they will be bored with the monotony soon. And with friends coming to stay over for lunch, their expectation for a delicious treat is but natural. 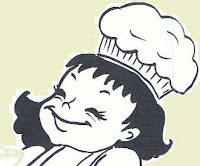 I always keep my ‘antennas’ up to pick up any new recipe, so that I could cook a new dish to keep the little ones happy. My daughter calls it the height of spoiling, but what are grand mothers for? 1. Pressure cook rice with with two times the volumes of water, such that it does not become mushy and the grains stand separate. Allow it to cool. 2. Heat oil in a pan and roast cashew nuts and raisins, drain and keep them aside. 3. In the same hot oil add the cumin seeds and the cinnamon powder. 4. When it is fried, add the chopped onion and fry until it turns pink in colour. 5. 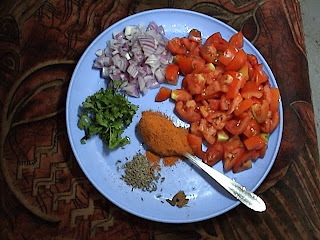 Add the finely chopped tomatoes, sambar powder, salt and sugar in the same order and stir well. 6. Cover with a lid and cook in slow fire. 7. Keep stirring now and then and cook till all the tomatoes turn into pulp. 8. When the gravy separates from the oil switch off the flame and add the chopped coriander leaves and the fried raisins and the cashew nuts. 9. Add the now cooled rice and blend well taking care not to mash the rice. 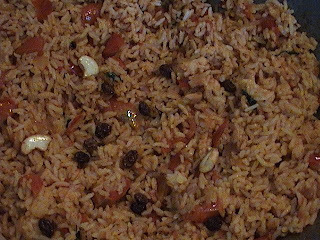 10 The tomato rice is ready for the stuffing. 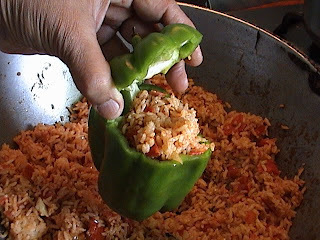 You can simply serve tomato rice as a dish as well. 1. Wash, dry and cut out a ‘lid’ on the top of each capsicum using a sharp knife. 2. Scoop out the seeds carefully so that the capsicum looks like a perfect box with a lid. 3. Spoon in the prepared Tomato Rice up to the brim and press the ‘lid’ firmly. 4. Heat oil in a shallow pan and add the tomatoes and salt and stir. 5. Arrange the stuffed capsicums in the pan leaving space to turn them occasionally. It is better to cook them in small batches if the pan does not accommodate. 6. 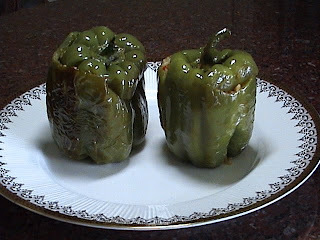 Turn each capsicum once, so that it is coated with oil and salt. 7. Cover with lid and let it cook on slow fire. 8. When you hear the sizzling sound turn the vegetable to the other side very gently so that the rice does not come out. 9. 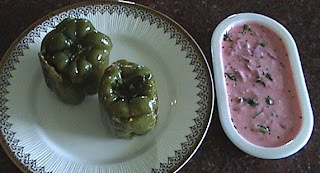 When it is done switch off fire and serve the sizzling hot capsicum stuff with beet root thair pachadi which is not only a treat to the palate but also to the eye as well. 1. Pressure cook the whole beet root along with its peel. 2. Cool it thoroughly or even refrigerate for 15 minutes. 3. Peel the beetroot just as you would peel the boiled potato. 4. Grate the beetroot in the using the larger side of the grater. 5. Add the salt to the curd and beat with a spoon. 6. 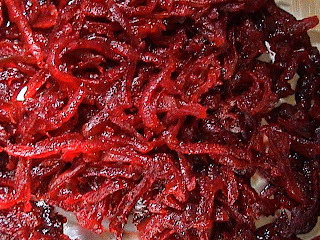 Add the grated beet root and blend lightly to avoid mashing up of the vegetable. 8. When it splutters add the cumin seeds. 9. 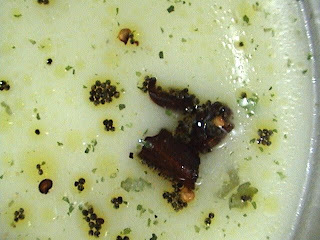 Pour the seasoning on to the pachadi. 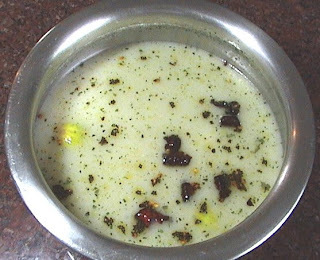 The cool and non spicy pachadi is a boon in the hot summer months. 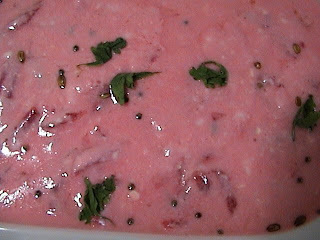 The beetroot thair pachadi in all its pink glory goes off to FIC Pink an event series started by Sunshinemom of Tongueticklers and currently hosted by Priya at Easy N Tasty Recipes! Updated: Yea! There is always an event every post can go to! The stuffed capsicum goes to Srivalli's Monthly Mingle - Kids Lunches. Monthly Mingle was started by Meeta of What's for Lunch Honey, read more about it here.